First the sauce, now the breakfast enchilada finale. Friends, these are BREAKFAST ENCHILADAS. Wait tho let me say that again: break-fast-en-chi-la-das. That you are going to make in your own house and then devour as breakfast (and lunch and dinner and midnight snack) for the foreseeable days ahead. That are going to make you either a breakfast hero to yourself or a breakfast hero to the world’s luckiest souls who get to share this pan of cheesy goodness with you. Things are looking real good, guys. Reeeeal good. Additional fire roasted tomatoes? Mushrooms? BACON? Be my guest. You fill those breakfast enchiladas up to your enchilada-loving heart’s delight. Once you figure out your filling, things are about to be wrapped up in a nice snug tortilla hug and blessed with that Creamy Spinach and Roasted Poblano Sauce that we just got done adoring. How do I even express my love? How? This combo of flavors + my hungry tastebuds + everyone’s favorite meal of the day… it’s magical. On a more personal note 👋 I’m headed off today for a girls’ weekend getaway! Last year for our first-ever girls’ weekend getaway, we went to Aspen, CO for a lattes / fall hikes / hot tubbing kind of vibe. It was EVERYTHING. In the way that you come home from a weekend of straight hang outs and talking and FUN, are semi-depressed for a week, and then immediately start planning your next getaway. In this phase of life, scheduling something means we are working around babies (um, do blog babies count?) and pregnancies and feeding schedules, but we made it work! And so this year – on this very day – we are headed to Scottsdale, AZ for more of a sun / spa / pool kind of situation. And while Scottsdale might be feeling more like a spring day than the hot and steamy tropics right now, luckily I am of the variety of people who feels that any temperature over 60 degrees justifies pool time, so bring it on, Scottsdale. Bring. It. On. I’ll be vacation-snapping the weekend away (-> pinchofyum), so please tell me you have Snapchat. PLZZZ. Just thinking about this now -> making a pan of these breakfast enchiladas and tucking them away in the freezer would not be a bad strategy for dealing with the post-vacation blues that I know will follow this weekend. I think I might be on to something here. Bjork and I made this twice and both times we ate it for breakfast, lunch, and dinner for, like, two days straight before it was all gone. 😭 I SO looked forward to eating the leftovers every day – and we need that kind of positivity in our lives during the month of February, don’t we? Go go go. Breakfast Enchilada power to you! Breakfast Enchiladas – with scrambled eggs, chili potatoes, spicy turkey, cheese, and a homemade roasted poblano sauce. SUPER yummy! Love this recipe for breakfast, brunch, or brinner. POTATOES: Heat a large skillet to medium high heat. Add the olive oil, potatoes, and half of the spices and salt; saute until golden brown and tender-crisp. Transfer to a bowl and set aside. TURKEY: In the same pan, add the turkey and half of the spices and salt. Break apart into small pieces until fully cooked. Transfer to a bowl and set aside. EGGS: In the same pan, with the heat tuned to low, add the eggs and push around gently in the pan until barely scrambled. Add the potatoes, turkey, half the cheese, and 1/2 cup of the poblano sauce to the pan with the eggs. Stir to combine. ASSEMBLY: Preheat the oven to 350 degrees. Grease a 9×13 pan and spread a thin layer of poblano sauce over the bottom. Fill each tortilla with the egg/turkey/potato mixture and roll up; place seam side down in the baking dish. Cover with remaining poblano sauce and cheese. 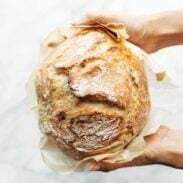 BAKING: Bake for 20 minutes until bubbly and hot. Serve immediately (but this also makes great leftovers). I had to use two pans to hold all 10 enchiladas. My 9×13 only held about 6 because of the size of tortillas we were using. The tortillas absorb a lot while they bake, and they can get a little dry and stiff if not coated in sauce. So one little hack is to set aside a little bit of sauce and mix it with water to create a very thin sauce that you can coat each tortilla with before rolling. Note: Nutrition label is for the filling only. Tortillas vary greatly, so I left that out. The sauce has its own nutrition label, so you’ll have to add the filling (listed here) + sauce + tortilla to get a full nutritional count. So excited for you <3 I will be snap stalking your fun this weekend and eating all the breakfast enchiladas to eat my feelings of not being on a weekend getaway 😀 Woohoo AZ! Ahh I’ve been anxiously awaiting this recipe ever since reading your recipe yesterday and seeing that you were gonna post some breakfast enchiladas! Definitely making these for brunch next week when my mom comes into town 🙂 Have so much fun in AZ!! These look fabulous! 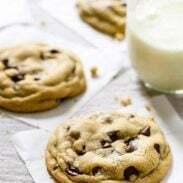 I can not wait to try them out soon and I know my hubby will be thanking you for the recipe!! BTW I live in Gilbert, AZ (close to Scottsdale) and it is supposed to be 78 and sunny this weekend. Perfect for your girls getaway! Enjoy! 78 degrees sounds unreal. In Buffalo, it’s snowing and has been for months. However, Breakfast Enchiladas might just get me outta bed tomorrow morning. This ain’t no pinch of yum, it’s a whole dollop! You are totally a breakfast hero!! I adore enchiladas, but never thought of making them into a breakfast food. This recipe is PERFECT for that! Sharing! <3 Enjoy your girls' weekend! 1) this recipe does look fantastic. It’s like breakfast burritos in an enchilada format. I’ll certainly try it. 2) I have never seen “large” corn tortillas. Has anyone? 3) The type of potato might be important. I’d go for Yukon golds here, and not russet. 4) Your photos show a nice garnish of what I’m guessing is cilantro, but I’m not seeing that in your recipe as an ingredient. Might you want to add this? Yum yum yum!! I saw the sauce yesterday and could not wait for the enchiladas! I would totally take these for breakfast any day 😀 !!! AAHH this meal!! I’m a big fan of soft scrambled too 🙂 And I’m in love with that poblano sauce. I’ve never done breakfast enchiladas, they sound amazing! I don’t normally make breakfast but these would be great for when guests visit! What a great alternative! Usually I will make huevos rancheros, but this will be a great new Mexican breakfast dish to change it up. How brilliant are these! Loving that poblano sauce too! Hope you have a wonderful girls weekend! These look so good…my son is going to love them. Enjoy your girls’ weekend! liquid aminos. GREAT healthy choice! Never tried that – thanks for the tip! Yay ! Have fun in Arizona. So jealous! I will be looking forward to your snaps! Those breakfast enchiladas look amazing! I, too, am picky about my scrambled eggs. Soft or nothing! I think this would be perfect for a brunch gathering – definitely going to save it for my next morning potluck! Oooo have fun on your girl trip! Can’t wait to see pictures. These look absolutely amazing. I feel a breakfast for dinner Friday night coming on at my house tonight! Woo-hoo! This recipe looks amazing!! Great idea. This looks awesome! I must try this. Thanks for sharing. Looks delicious, but where’s the poblano sauce recipe? Surely that should be made first? This would be a tasty breakfast! Looks delicious. Hi! This looks great! Do you think the enchiladas would freeze well? I made this the other night and it was SO GOOD. That green sauce is incredible. The leftovers were just as good. Thanks for another delicious recipe! 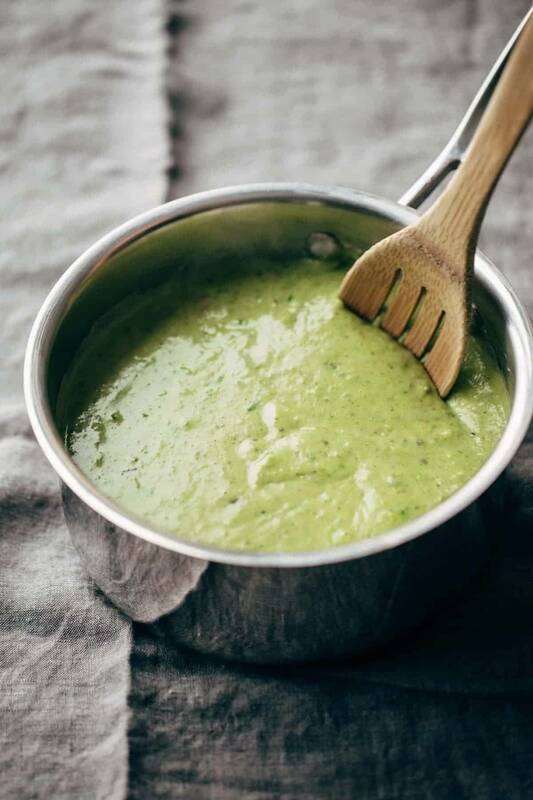 The recipe for the poblano sauce is here: https://pinchofyum.com/creamy-spinach-and-roasted-poblano-sauce. Lindsay, I have never made enchiladas for breakfast, but your recipe looks wonderful. I could eat breakfast food any time of the day.